Your Story: Your results give you an unprecedented view of your lineage. You will discover the migration paths your ancient ancestors followed hundreds and even thousands of years ago as humans spread out of Africa and around the globe. You will also learn the details of your unique ancestral makeup—the biological and geographical components that make up who you are. What are the ingredients, and how much of a mixture is your own DNA recipe? Included in the 300,000 markers we test for is a subset that scientists have recently determined to be from our hominin cousins, the Neanderthals, who split from our lineage around 500,000 years ago. 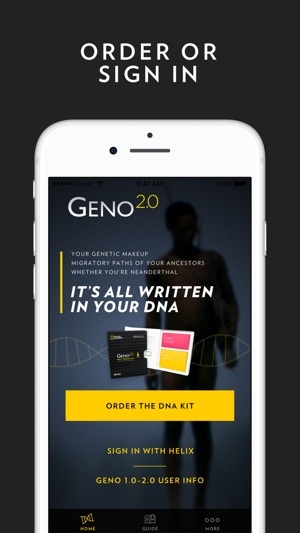 With Geno 2.0, you will learn if you have any Neanderthal DNA in your genome. Our Story: Your results are just the beginning. By regularly visiting the Geno 2.0 website you can find out more as Geno 2.0 scientists pull together connections, uncover new paths, and provide fresh insights into your ancestry. You’ll find informative graphics, interactive features, video, and news stories, and learn about the broader historical context of your results. The Human Story: Working together, we are uncovering the story of the greatest journey ever told: how our ancestors migrated from their African homeland to populate the Earth tens of thousands of years ago. By carefully comparing the DNA from world populations that have been genetically, and geographically, stable for hundreds or thousands of years, we can chart a more complete map of the early stages of human history – and your family’s part in it. Welcome to the expedition of a lifetime! 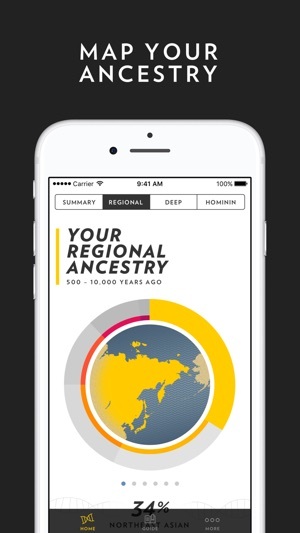 Download the updated Geno 2.0 DNA app and take a ride through history! * Improved Neanderthal selfie - post it to Facebook! I downloaded the app after using the desktop version of Geno 2.0, and I’m so glad I did! Geno 2.0 gives some really great ancestry info about your regional, deep, and Neanderthal genetic heritage. 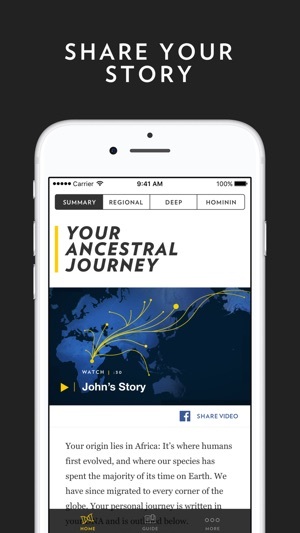 And all that info gets translated into this super cool video journey of your ancestors around the world. (And they have built-in ways for you to share it to Facebook.) And even the non-video presentations of the info really pop — particularly the globe! The only drawback is that the “Genius” results (seeing how closely related you are to historical figures like Genghis Khan or Queen Victoria) aren’t included in the app. But those aren’t the most important part, so it’s not a huge drawback. Cannot get it to work. I received an email telling me my results were ready to view. Every time I open the app it tells me my results are not ready. I have deleted the app and downloaded it twice. I have signed out and signed back in numerous times. I have emailed three different “customer service” email addresses. Each time I received a message back telling me they can’t help, I need to email someone else. Very disappointed. Not even close to what was advertised. 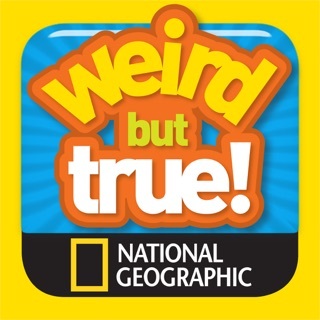 It looks to me nat geo is more interested in getting your money than providing the customer with what is advertised. 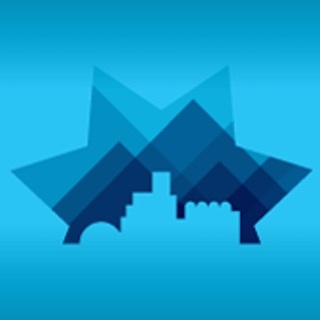 I'm very sorry that you are having a disappointing experience accessing your results in the app and I appreciate you reaching out to get the issue resolved. One of features customers are excited about in the app is a personalized video that you can share on Facebook as part of your Geno 2.0 results. We process the videos nightly (at midnight) and so your results in the app display once the video is processed and syncs with the website. You should be able to access the results in the app now as well as your custom, sharable (on Facebook) video. I think you bring up a good point for us to update the “results ready” email to reflect the video and syncing process for the app. If you continue to experience issues or have ideas for the app, feel free to email our support team at genographichelix@natgeo.com. I purchased the DNA kit, was notified my results are ready, and am so excited to view my results. Too bad that every time I click the view results button in the app it crashes. I’ve tried signing out and then back in, I’ve tried deleting the app and reinstalling it multiple times and nothing works. 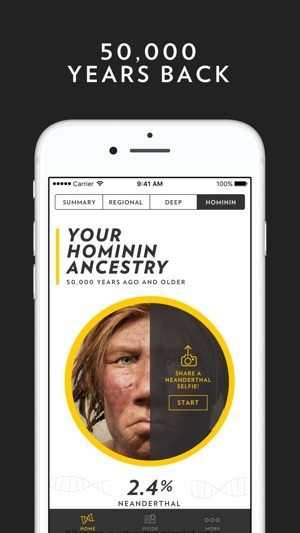 The only way I can view my results is to sign into the website and see them that way which means I can’t use any of the app specific features, like the Neanderthal photo. So again, great idea for an app, too bad it doesn’t work.